Now in existence for over 35 years, Old Rajans Scout Association (ORSA) continues to strive to expand its programs and offerings to the Dharmaraja College, Kandy. On the invitation of ORSA Mr. John Henry de Saram’s son Mr. John Henricus de Saram agreed to support in one or more of the many exciting events that we are offering Centenary Year and experience firsthand the pride we take in supporting our cause. It is our mission to “Towards Global Leadership”. In order to meet our mission and provide services in our movement, we rely on the generosity of our founder Mr. John Henry de Saram’s family for support. Mr. John Henricus de Saram made a contribution of SLR 150,000.00 to start the John Henry de Saram Memorial Scholarship Fund by allowing us to continue in our work. The John Henry De Saram Memorial Scholarship Fund is to be established in memory of late J. H. de Saram (founder of Dharmaraja Scouting) to assist President Scout Badge winners in completing their education at Dharmaraja College, Kandy. The J. H. De Saram Memorial Scholarship Fund is created with SLR 150,000.00 in the 2013 and is continue to be sustained through the generosity of John Henricus de Saram’s family. Scholarship range from SLR 10,000.00. (These are one time awards) Scholarship winners are recognized at the annual prize giving ceremony. Dharmaraja College Students aged below 20 years. Have won a President Scout Badge representing 1st Kandy Dharmaraja Scout Group. Have gained highest marks at the GCE Advanced Level examination for university entrance among the President Scout Badge winners in any stream. Appointed by the Principal, Dharmaraja College, Kandy. This inaugural J.H.De Saram Memorial Scholarship will be awarded at the 2013 Annual Prize Giving on the 12th of July, 2013. The project was initiated and driven by one of the pioneer members of ORSA Mr. Ananda Melpitya. Lakmal Buddika Meegahapola a president scout badge winner in 2010 & the 238th Island merit ranker at the GCE A/L 2012 under Physical Scinece stream ,won the John Henry de Seram memorial scholarship for the 1st time in the Dharmaraja scouting history ,at the Annual prize giving ceremony held at the college auditorium recently. The scholarship was awarded by John Henricus de Seram ,in memory of his father and the founder of Dharmaraja scouting started by John Henry de Seram in 1993. The 1st Kandy Dharmaraja scout group celebrated its cntenary in February 2013 with an international scout gathering of over 5000 scouts from all over the world. 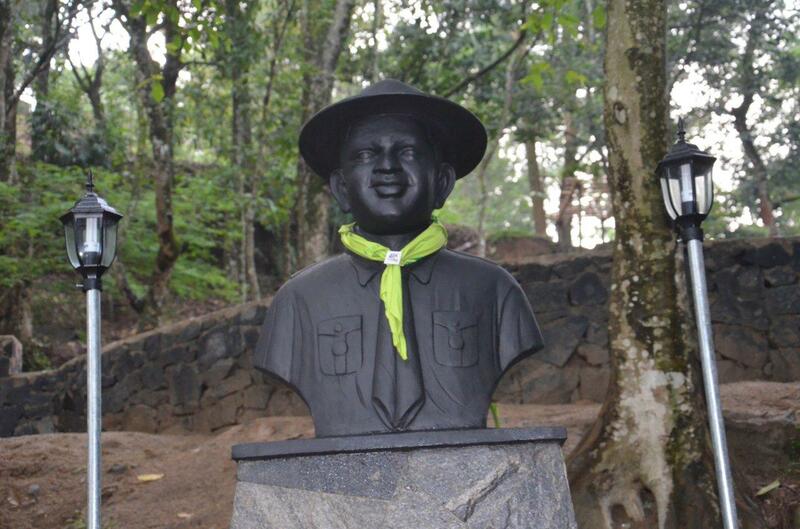 The statue of J.H de Seram was unveilled during the centenary celebrations in February at the Lake view park International scout centre,Dharmaraja college,Kandy.The schol is awarded to a scout who is the winner of President scout badge with the highest Z-score mark at the GCE A/Ls every year. Here Lakmal Buddika Meegahapola recieves his award from the chief guest,Bandula Gunawardena,Minister of Education. S.M Keerthirathne,the Principal of the college is also in the picture.